One day, we were sitting around the large desk of one of our conference rooms, discussing over and unders and the staggering heritage that links these guns to the five centuries of Beretta history. At one point, Angela pointed out that most people recognize the Beretta logo: the iconic three arrows and circles often referred to as "Trident," but that most people don't really know why and how Beretta's logo came to be. On our Facebook and Twitter accounts, we have mentioned it, in the past, and have answered questions about just this, but I thought it wise to publish a quick post about our most recognizable graphic. Like all respectable 500-year old companies, Beretta has had its share of logos: the shield with the letters "PB" (for Pietro Beretta, the father of the industrialized Beretta,) the duck with open wings, and the more simple "Fabbrica d'Armi Pietro Beretta" are some of the representations that many of our readers will recognize. And then, there's the "Trident," which (truth be told) is not a trident at all. The story of this logo starts not far from Gardone Val Trompia, in the small town of Cargnacco, where poet, writer, director, mariner and journalist Gabriele d'Annunzio ended his days, in the late 1930s. When you walk into the villa that Gabriele d'Annunzio purchased and where he retired, you will find the very first "Trident." It was he who, ever-the-artist, developed this graphic design to symbolize the will to get things done. The encircled arrows represent the three shots fired by a battleship that engages a potential enemy: the arrow on the left reprents the first warning shot, fired at the ship's stern; the arrow on the right represents the second warning shot, fired at the ship's bow. The central arrow is the last round fired, when the ship doesn't yield: this one is aimed at the ship itself. 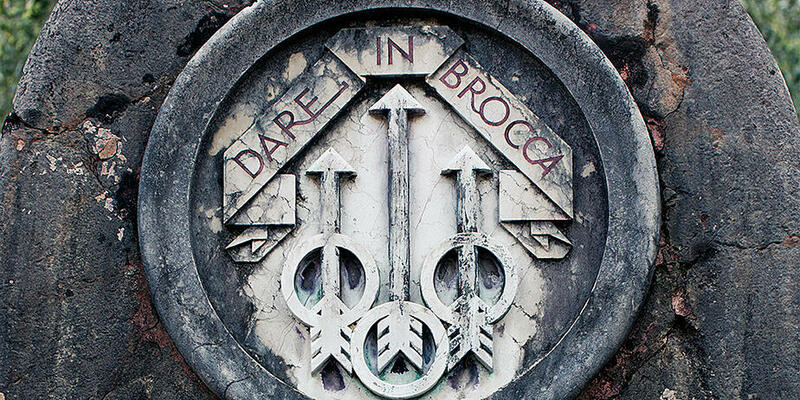 The logo was dubbed "Dare In Brocca" or "hit the target." Mr. Beretta was fascinated with this symbol, and asked Gabriele d'Annunzio if he could "borrow it." Gabriele d'Annunzio gave Mr. Beretta the rights to use it as the company's symbol, and from that moment, the "Trident" became the company's logo. So, now you know it. Next time you're wearing a hat like this one, or carry your Beretta firearm to the range or on the field, make sure you share this story with your fellow shooters!